Major UK banks must raise a total of £25bn in extra capital by the end of 2013 to guard against potential losses, the Bank of England (BoE) has said. In a statement, the BoE's Financial Policy Committee (FPC) said only some banks need to raise the cash, but did not name them. 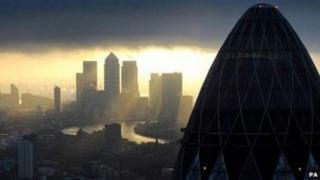 It said banks could face losses of about £50bn over the next three years, relating to bad loans and fines. The order is the first from the FPC, the new financial stability regulator. It said UK banks and building societies could lose billions of pounds over the next three years relating to "high-risk" loans in the UK commercial property sector and vulnerable eurozone economies. They may also lose money through fines, and require extra capital to support a "more prudent approach to risk". Some banks already have enough capital to cover these costs, the FPC said, but others are short. Yet more money may need to be raised after the end of 2013, the FPC warned, so that banks conform to incoming "Basel III" accords on banking regulation. Media captionTreasury Select Committee chairman Andrew Tyrie: "What we need now is safer banks"
No new government money will be required. Banks are likely to raise the funds by issuing more bonds or selling shares. But BBC business editor Robert Peston says in the short term the need to raise cash will be bad news for investors, including taxpayers who still own big stakes in two banks - Royal Bank of Scotland and Lloyds. If these banks are among those that need to raise more capital, it may delay plans to sell the stakes back to private investors. In a statement RBS insisted it had "a strong capital position". "We will continue to work with our regulators to ensure RBS remains at the forefront of international capital standards," it said. However, by midday RBS shares were down 3%. Other bank shares reflected a mixed response to the FPC's announcement. Shares in Lloyds were up more than 1.6%, while HSBC and Barclays were both down by about 0.5%. The British Bankers' Association, the banking trade body, described the FPC's report as "the latest step in an ongoing discussion between the UK's banks and their regulators" about the levels of capital they should be holding. It said raising capital levels needed to be done in such a way as to support growth. The FPC said capital raising measures were also designed to ensure that banks were able to continue lending to businesses and each other, should another banking crisis hit. The extra capital was needed "to ensure sufficient capacity to absorb losses and sustain lending", the FPC said. The FPC has overall responsibility for financial regulation in the UK and is part of a new order of regulation designed to keep the banks under closer scrutiny. It will oversee two new financial watchdogs: the Prudential Regulation Authority (PRA), which will take over responsibility for supervising the safety and soundness of individual financial firms, and the Financial Conduct Authority (FCA), which will be tasked with protecting consumers and making sure that workers in the financial services sector comply with rules. The new watchdogs will replace the Financial Services Authority (FSA), which is set to close next week.